1. 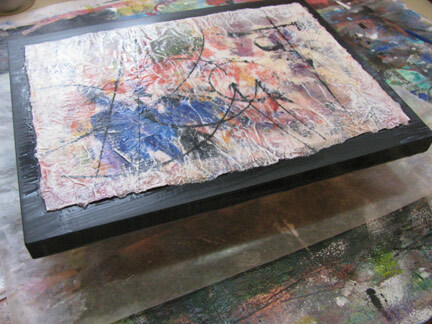 Paint the sides and the edges of the clean wood panel with black acrylic paint. Allow to dry completely. Use your ruler and pencil to make very small dots where each corner of your painting will go. 2. If your painting hasn't already been sprayed with clear acrylic spray, do that now and let it dry. Use a foam roller or brush to coat both the back of the painting and the surface of the wood panel (inside the lines where the painting will sit) with thin layers of gloss medium. 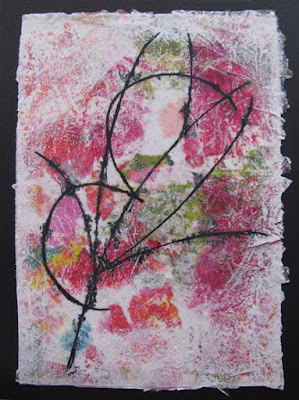 Place the painting carefully and brayer it down from the middle outward, being careful not to let the painting slip. Place it on waxed paper on a super-flat surface and weight it down to dry overnight. 3. 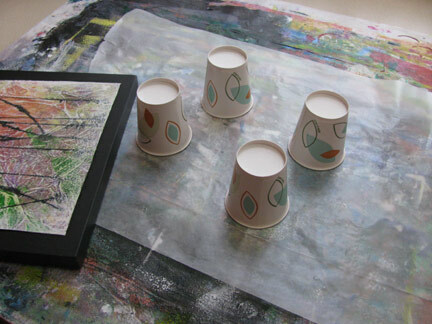 Place your painting up on several small paper cups and begin to apply the varnish with a 1" brush. Begin with the gloss varnish and apply 3 thin coats, letting each dry completely. Make sure you get the sides too. I like a total of 5 coats, and even though I want these pieces to be finished matte, I still start with gloss varnish. 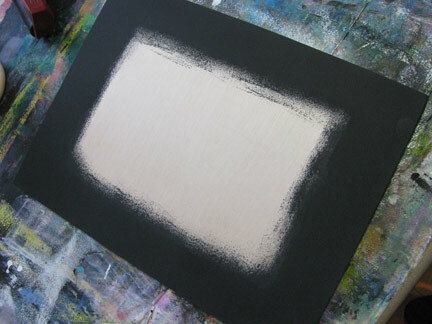 Too many layers of matte or satin varnish begin to look cloudy, whereas gloss varnish always stays nice and clear. Also, matte varnish can sometimes dull the colors if it applied directly to the painting. 4. Here the piece has 3 coats of gloss varnish, the current coat not completely dry yet. Once it is dry, I will finish with 2 coats of matte varnish, letting each dry. No more than 2 coats of either matte or satin on top of the base of 3 coats of gloss varnish! I know, I'm repeating myself, but this is important!! A tutorial for the basic techniques used in these paintings is at the link.